Shah Alam is having another flower festival at the moment (16-18 Dec 2011). This is part of the Lake Carnival (Karnival Tasik) where there is a Grand Finale to a fishing competition (Pertandingan Memancing GP Selangor). The flower festival is of course just stalls set up by nurseries selling fruit trees, herbs, flowers and orchids. Parking is almost non-existent nearby (save for a tiny parking lot). You can park at the PKNS complex across the road, or park further away and walk. Some take the risk and park illegally by the roadside. At last year's festival, some of the visitors and stall owners fell victim to multiple summons by the traffic police. 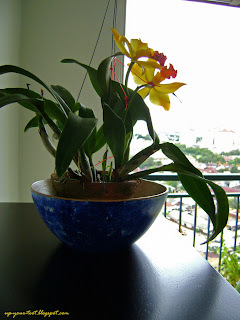 Inspired by Autumn Belle's beautiful orchid pictures, I made up my mind that I will get an orchid for the cabinet by the balcony sliding door, as the top is bare with just a painted bowl sitting there. I finally choose a Rhyncattleanthe Varut Feastful. Rhyncattleanthe Varut Feastful syn. Potinara Varut Feastful. The stalls that lined part of Persiaran Tasik at Shah Alam. If the nothogenus Rhyncattleanthe seems a little odd to you, it is formed when the Cattleya alliance was reshuffled after considering DNA studies on members of the family. Previously, it is known as Potinara Varut Feastful (and still remains a valid synonym under the orchid registry). Among local nurseries, this plant suffers a severe genus confusion, and I have seen it sold as Laeliocattleya (Lc.) or Sophrolaeliocattleya (Slc.). 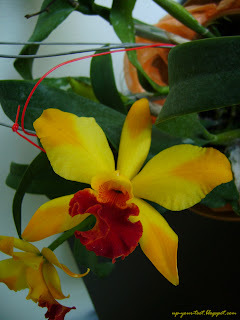 Some people have it labelled as Brassolaeliocattleya Varut Feastfull. A search in the RHS Orchid Registry at this point of time would reveal that there is only one Varut Feastful, a Rhyncattleanthe Varut Feastful. Now back to Rhyncattleanthe Varut Feastful, the nothogenus Rhyncattleanthe is made up from Rhyncholaelia, Cattleya and Guarianthe and abbreviated Rth. The flower is one of the 'splash type' Cattleyas and it emits a lemony spicy scent (reminiscent of the scent emitted by Phalaenopsis bellina, but 'spicier') in the morning and the scent is undetectable at night. Sitting in a bowl atop a cabinet - Rth. Varut Feastful enjoying the view of KL skyline. The light at where the orchid is placed varies from as low as 500 to usually about 1000 - 3000 foot-candles, which is a little low for a Cattleya. So I would have to move the plant out when it has finished blooming. The light conditions are more suitable for a Phalaenopsis, but I just can't stand one of those splotchy coloured Phalaenopsis. 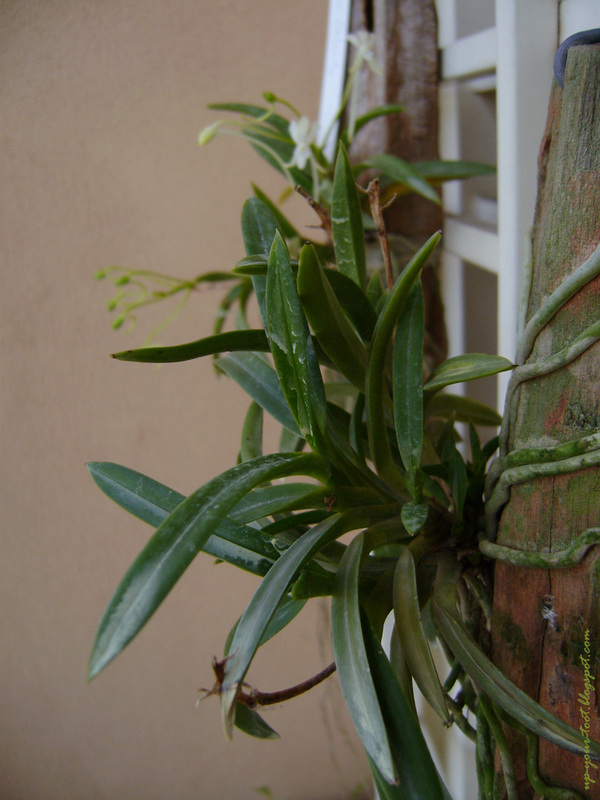 I also got another slab of Neofinetia falcata, as I like the jasmine scent that the flowers emits in the evening and at night. Added another slab of N. falcata to the balcony. The plant that I got during the 18th Shah Alam Orchid Festival is in the background. I had parked on the other side of Tasik Permai (Permai Lake), so on the way back to my car, I took some photos of the storks (painted storks?) nesting and roosting on the tall Casuarina trees lining the lake. I wonder if anyone has ever gotten pooped on by a stork/egret/crane when looking up at their roosting site, though I am not too keen to hang around and find out through first hand experience myself. 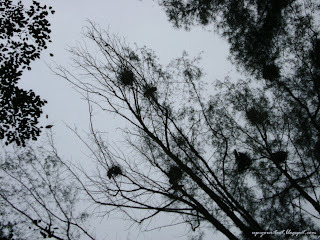 Nesting storks at Tasik Permai Shah Alam. Hi Sean, Thank you for the identification. I have put up a link to this blog on my current post. We do have the Asian Koels here which are much bigger than the starlings. Since they are seen together and all had red eyes, I had assumed they are in the same family. They are all attracted to the fruits on the trees. They tend to defend trees from other birds and drive them out. Have you seen any of the Philippine starlings raising the young of a Koel? Coz that would be interesting. I need to make one correction, the juvenile is like the females, and have dark, not red eyes. Ooops for that mistake. I grew up in Shah Alam and used to walk to PKNS. But I never seen storks nesting at Tasik Permai Shah Alam.That is lovely choice of orchid you brought back home. Really? Cool. It is a nice lake, except for the litter that goes into the water. I heard strange calls and looked up when I pass by the Casuarina trees. Some of them were taking nesting materials to the trees. I wanted to buy more orchids, since the price wasn't too expensive (RM30 for the Rhyncattleanthe), but I remembered that I have limited space now. Thank you very much for the kind mention! I must put a link of this post to my directory so that I can remember the next 19th Pesta Bunga SA. I think you just got yourself a very good buy at RM30 only. The orchid is stunning! It is even enjoying a great view of KL's skyline. Scented orchids sounds irresistable. Wishing you a Merry Christmas, Sean L! Thanks for the link. A Merry Christmas to you too, Autumn Belle.